BudgetHosting Review 2019: Is BudgetHosting a Good Hosting? BudgetHosting Singapore provides web hosting solutions to SMEs in Singapore, Indonesia, Malaysia, the United States, and Australia. The company, owned by EN Technologies, is focused on the provision of affordable, high-performance website hosting. 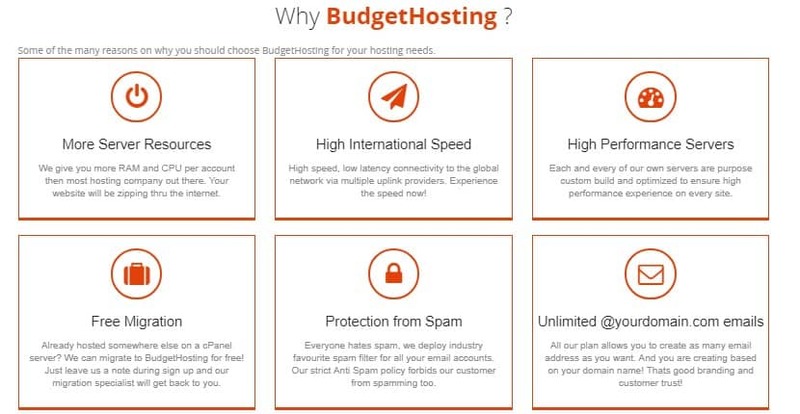 BudgetHosting Singapore has limited their hosting solutions to just three shared hosting plans, enabling them to offer high-quality yet affordable packages to organizations in Singapore, Indonesia, Malaysia, the United States, and Australia. In operation since 2001, their website is only available in English. The caveat with the unlimited data transfer is that this must fall within their Acceptable Use Policy, as is the case with many other hosting providers. They haven’t specified a cap at which your bandwidth will be throttled, but they do mention in the fine print that they will investigate should there be a slowdown in service. If it so happens that you’ve regularly been exceeding their unspecified limits, they’ll require you to upgrade to a dedicated bandwidth solution. Free migration – BudgetHosting provides free website migration services to clients moving their websites from their former hosting vendor’s servers. All they have to do is leave a request note to their migration experts during sign up. Spam protection – BudgetHosting uses some of the most preferred spam filters in the industry to filter all types of spam emails from every one of your email accounts. High-performance servers – BudgetHosting only works with the servers they have complete ownership of so that they can guarantee that every website they host will experience the highest possible performance. Compared to other hosting companies of similar caliber in Singapore and beyond, BudgetHosting is one of the best in the provision of CPU and RAM per account. Excellent speeds – BudgetHosting promises their users websites with low latency and high speed connectivity to the international network via numerous uplink providers. Sadly, BudgetHosting Singapore doesn’t provide their users with any uptime guarantees. You can choose to cancel your account at any time, but you won’t be refunded for any unused time on the amount you’ve prepaid. It should also be noted that only their priciest plan, the New Smart Business, offers a free .com domain upon purchase of an annual contract. In addition, their Smart Basic plan does not give its users any free SSL certificates. The company has definitely fulfilled their promise of providing high-quality hosting at pocket-friendly prices, though it should be noted that this is solely for the hosting alone: since only their priciest plan offers you a free top-level domain registration, the cost of your domain may well equal a large percentage of your annual hosting fees. Clients pay for monthly or annual plans that include the Smart Basic Plan, Smart Blog Plan, and Smart Business Plan. These hosting plans are designed with different businesses in mind, making BudgetHosting a great choice for individuals, small businesses, or those with multiple websites. Unfortunately, the company offers no money back guarantees, has no free hosting plans, and no free trial period for any of their hosting packages, so going with them means that you’ll be taking a larger risk than with most other providers. Since they only have three plans, the process of upgrading or downgrading your plan is quite straightforward, but the BudgetHosting support team is available to help you through the process if you get stuck at any point. BudgetHosting’s technical support is available 24/7 via a ticket system. The hosting provider will help you deal with any emergencies or emerging issues that their rather limited knowledge base doesn’t adequately address. I’m happy to report that the ticket I opened was almost immediately looked into, though it took two days for my server issues to be fully resolved. Unfortunately, BudgetHosting has no live chat or phone number that you can use to reach their support team, which may be problematic for customers especially during an emergency. BudgetHosting Singapore lives up to their promise of providing small to mid-sized businesses with affordable yet super-fast hosting solutions, but the lack of free domain registration with their plans and their limited support channels may prove to be problematic for all but the most tech-savvy SME owners. Wondering how BudgetHosting stacks up against other Web Hosting companies? Enter any other Web Hosting company and we will give you a side-by-side comparison.